It’s fun to study history with an emphasis on something your student enjoys. My eighth grade daughter loves to sew, and she has grown quite talented at it over the years. This year we combined literature and history with her love of making fashions. Perhaps you have a child who wants to sew, or maybe you have a young fashionista in your midst? Either way, here’s a look at how we have incorporated fashion design into our homeschool. Unit Study– If you use this approach, you can easily choose a piece of literature and/or time period in history and study it. The fashion would tie those elements together and offer you a great project to pursue. Literature Approach– Choose books from across various times in history and study each book, its author, and the time in which it was written. Add fashion research to the study. We did this with Jules Verne’s Around the World in 80 Days. Story Setting– Rather than focus on the author and the time in which the story was written, you could choose the story’s setting. In the case of Around the World in 80 Days, it was still the Victorian era with its fascination of world travel. Chronological History– If you are studying history strictly chronologically, then you might consider adding fashion to your agenda. Allow your student to research different fashions over time, among classes of people, and around the world all during the same portion of the timeline. What People Wore When: A Complete Illustrated History of Costume from Ancient Times to the Nineteenth Century for Every Level of Society– A visual overview of fashion throughout the ages. Steampunk Pinterest Board– This is my Steampunk collection on Pinterest where my daughter could reference the fashions. Please be aware that the steampunk culture may not be super child friendly at all times. I created this board so she could use it as a reference itself without clicking through to all the websites. You’ll find many Victorian fashion pins along with steampunk fashions and American Girl dolls in steampunk. Here are the first two projects from this year — doll sized fashions. The next one she’ll be working on is a Civil War Ball Gown for our annual Civil War Ball. Jules Verne: Literature, History, and Fashion– A post detailing the project on Around the World in 80 Days, Jules Verne, and Steampunk fashion. You’ll find the start of the dress and the dress design there. Project: Steampunk Fashion Design & Drafting– The details on how the patterns were drafted and how the final product turned out. Project: Middle Ages History & Fashion– This project involved many books on the Middle Ages and a study of Middle Ages fashion for all classes. Using fashion as a focus during her literature and history studies has been an authentic experience for our fashion designing daughter. She loves to do the research and find out how to make a garment that is reminiscent of days gone by. 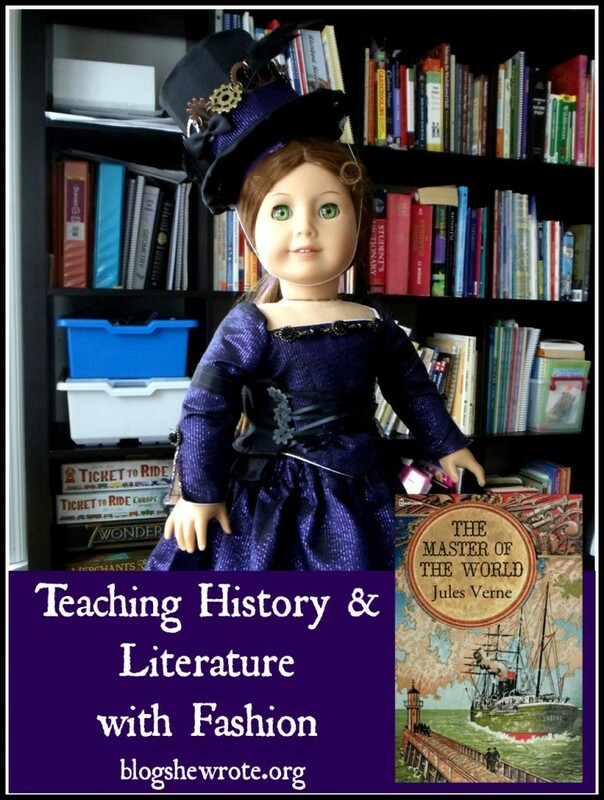 In what ways do you choose to make history and literature come alive in your homeschool? My name is Heather Woodie and I'm a homeschooling mom to our fantastic four– two in high school, one in middle school, and one last elementary student. I'm a former middle and high school biology teacher who has embraced the independent nature of homeschooling and I mentor my children through authentic, student driven projects and learning adventures. This year we are homeschooling 11th, 9th, 7th, and 4th grades. Oh No! It's the Mondays!